This week’s book review is a fun one for me. 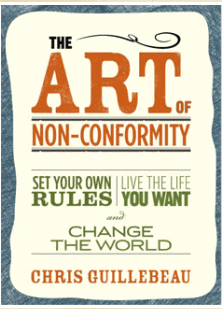 I’ve been a fan of Chris Guillbeau and his blog on the Art of Non-Conformity. His new book, with the same title, came out last week. As soon as I got it in the mail, I read it. Chris breaks down his book into 3 main parts. Each part highlights a component needed to achieve an unconventional life. If you’ve read Chris’ site, Part I will be very familiar as he goes through some benefits of living an unconventional life and shares his personal story. To get an idea of how much material Chris covers, here are the chapters in the book with my little notes on them. Sleepwalkers and the Living World: Chris opens up with his experience in graduate school and an illustration on how some people will keep you back from reach out from the norm. Setting the Terms of Your Unconventional Life: You’re exposed to the process of creating a life list and working backwards from it. Goal setting is a big ingredient for many trying to reach their personal dreams. Smashing through the Brick Wall of Fear: Fear holds many people from taking the leap and Chris discusses how to use it as motivation. How to Fight Authority and Win: You don’t always have to settle or the either/or solution. Chris discusses gatekeepers and their roles. Competence is Your Security: If you’re looking at starting a business, but don’t have a ton of money – this is a chapter for you. Graduate School vs the Blogosphere: Chris covers becoming an expert, not just through the traditional way. Comparing graduate school to blogging, he gets some unexpected results. The Power of Your Own Small Army: Recruit and inspiring a small army requires solid leadership. You can’t just hope people follow you, you have to give them a great reason for why they should. The Personal Finance Journey: Bills and financial obligations don’t go away just because you live an unconventional life. Wonderful ideas on simplifying your finances and how to invest in people. Radical Exclusion and the Quest for Abundance: Instead of trying to be everything to everyone, Chris offer the alternative of excluded what’s not important to you with what is your focus. Contrarian Adventures: This chapter talks about traveling and offers some hacks on cutting expenses and simplifying the process. Your Legacy Starts Now: Some people look back on their lives and wonder how they’ve made the world a better place. This chapter argues that you should start NOW to build your legacy step by step. Dangerous Ideas: Chris closes his book with an encouragement to introduce great positive change in your life and others. I really enjoyed this book and I felt like it was a wonderful extension of Chris’ blog. I’ve read his multimedia guides and have enjoyed them as well. I included it as a prize for the laptop giveaway because I think it’s a great general guidebook on striking off on your own. You can still use the information even if you have no desire to be self employed. I’d love to hear your thoughts. Have you’ve read the book or Chris’ blog? What is your take on the book?